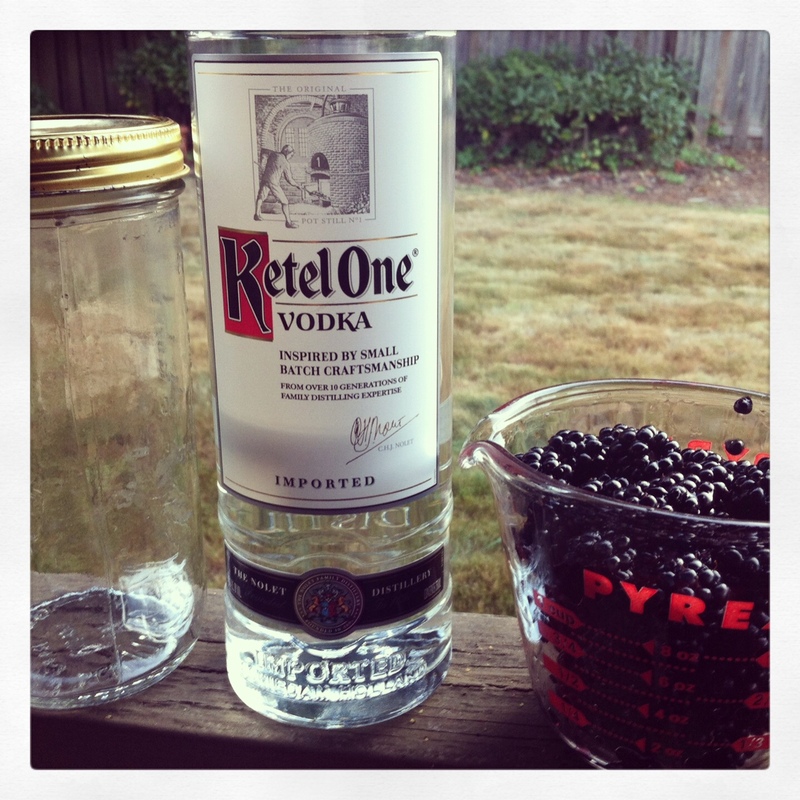 Last summer I wrote about making some infused vodka. I didn’t make a ton because I ended up eating MOST of the blackberries that were ripe… Ooops! 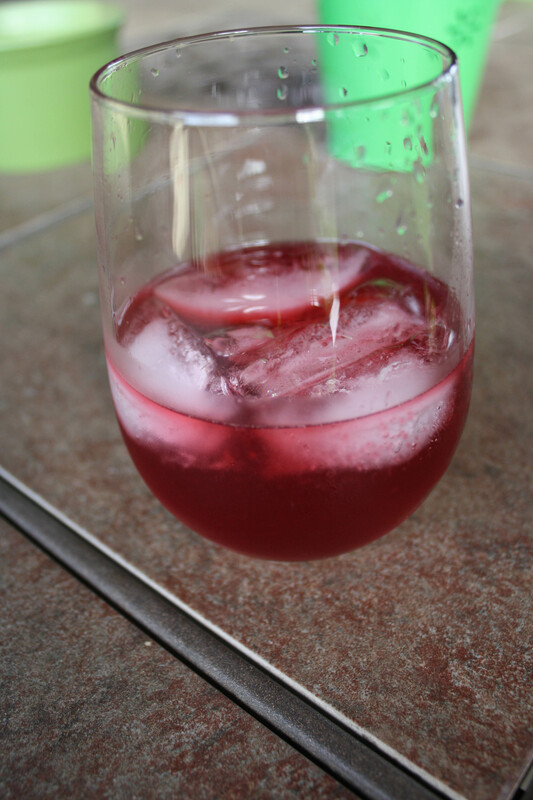 (One of my goals this summer is to go berry picking…which will be hard because I end up eating more than I pick…) Anyways, I made this blackberry vodka and let it sit for awhile. It was easy to make. 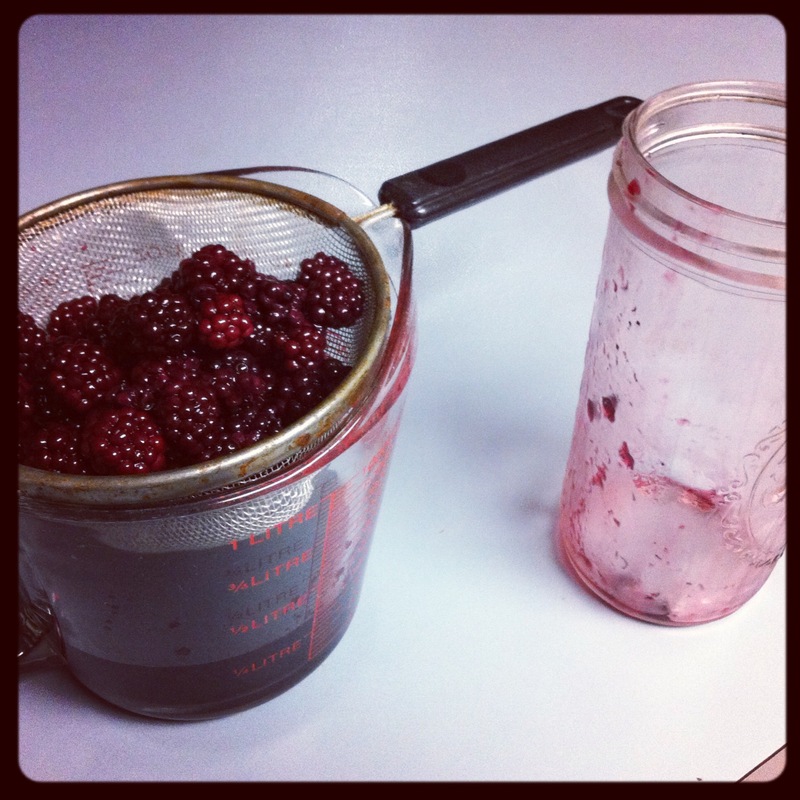 I picked a ton of blackberries from our yard, combined them with vodka in a mason jar and stuck it in the fridge. About once a week I would turn the jar over to mix it. It sat in the fridge for about two months. It was time to take the blackberries out. 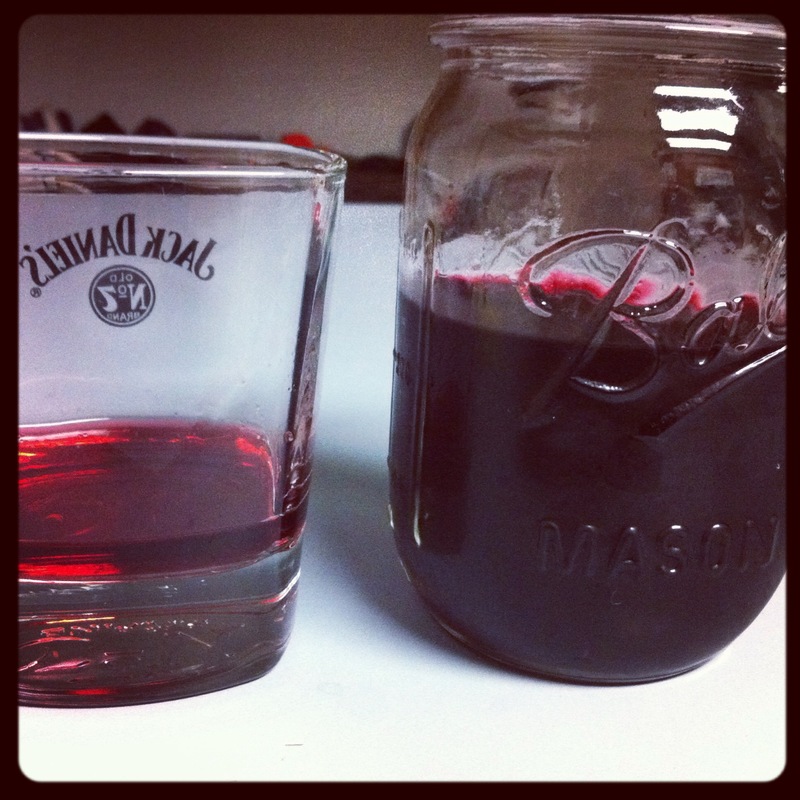 I strained the blackberries (which weren’t black anymore) and then put the vodka in a clean (and smaller) mason jar. Of course I had to sample my creation! I had a teeny sip. It was very potent. Michael asked, “What kind of Moonshine are you drinking? !” And yes, it was strong like Moonshine! It was sweet, too, which was interesting because I did not add any sugar to it. It wasn’t overly sweet, though. Muddle the lime juice, sugar, and blackberries in a glass. It was potent! 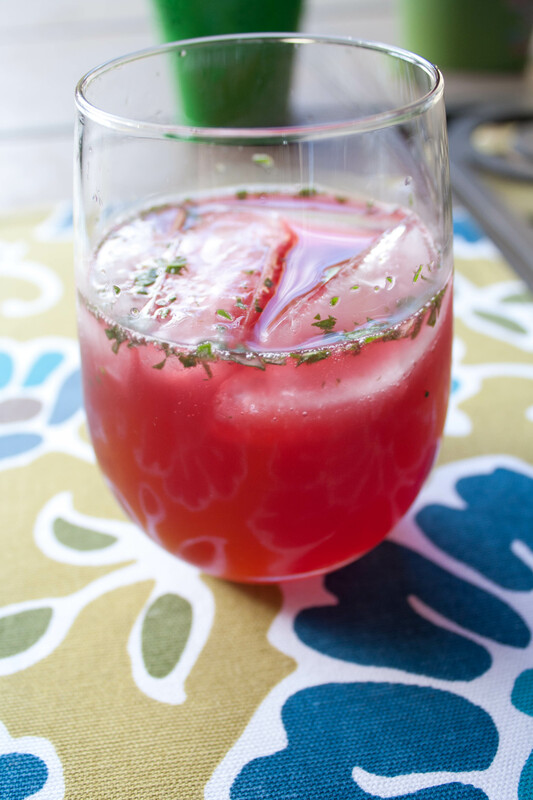 I took a sip and added a splash of lemon lime sparkling water and that lightened it up just a tad. It was great! French or Italian sparkling lemonade (in bottles at specialty food stores) or San Pellegrino Sparkling Lemon Beverage (in cans). Muddle basil with Stoli Blakberi. Serve on rocks and top off with Italian sparkling lemonade. I liked this one because in my opinion there isn’t anything better than fresh basil. (In fact, I need to plant another basil plant this year. 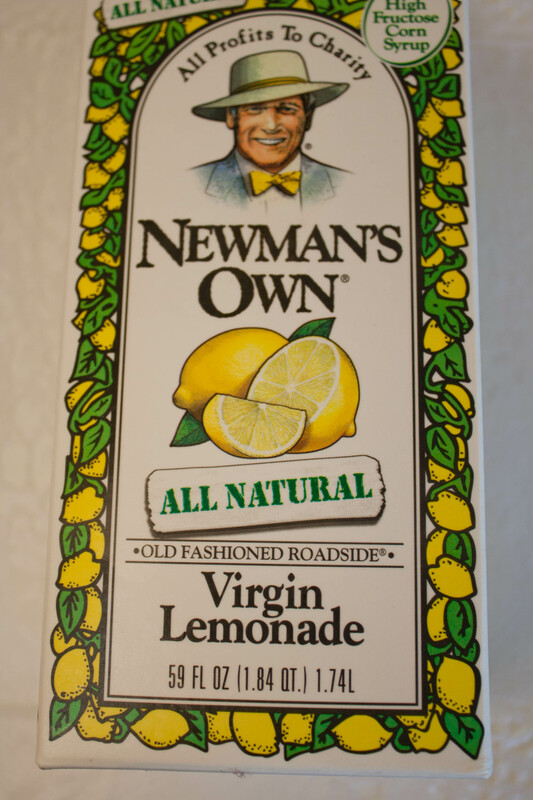 For some reason I didn’t do that this spring like I usually do…) I used some of the Newman’s Own lemonade — loved it! I need to buy this more often. I used just a splash of it in my drink. Of the two recipes, this second one was my absolute favorite. The flavors all balanced nicely and took some of the “bite” off the vodka. It tasted more like a refreshing summer drink than an alcoholic beverage. The minced basil was an excellent touch. I loved the flavor of the basil with the vodka. I am so sad now that it’s all gone. 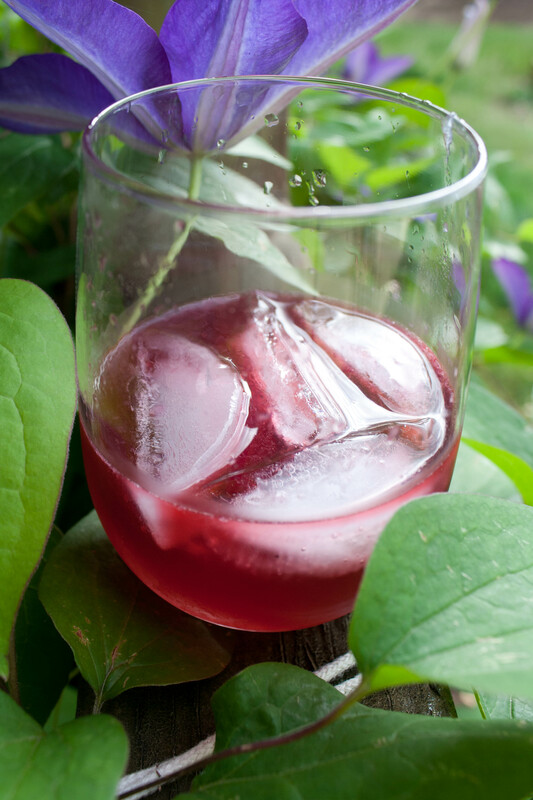 🙁 Perhaps I shouldn’t have chopped down all our blackberry bushes this year so I could make some more….Anyways, hope you enjoyed this post and give some of the recipes a try. They were really good! Cheers! Oh that sounds delicious! Thank you for the link. Our yard is being overgrown with blackberry bushes again so I’m sure I’ll have more this year…. Oh wow. That looks yummy. I want to make one of those.